Yet for all their talents, robots still can't make a cup of tea. That's because tasks such as turning the stove on, fetching the kettle and finding the milk and sugar require perceptual abilities that, for most machines, are still a fantasy. Among them is the ability to make sense of 3-D objects. While it's relatively straightforward for robots to "see" objects with cameras and other sensors, interpreting what they see, from a single glimpse, is more difficult. Duke University graduate student Ben Burchfiel says the most sophisticated robots in the world can't yet do what most children do automatically, but he and his colleagues may be closer to a solution. Burchfiel and his thesis advisor George Konidaris, now an assistant professor of computer science at Brown University, have developed new technology that enables machines to make sense of 3-D objects in a richer and more human-like way. A robot that clears dishes off a table, for example, must be able to adapt to an enormous variety of bowls, platters and plates in different sizes and shapes, left in disarray on a cluttered surface. Humans can glance at a new object and intuitively know what it is, whether it is right side up, upside down or sideways, in full view or partially obscured by other objects. Even when an object is partially hidden, we mentally fill in the parts we can't see. Their robot perception algorithm can simultaneously guess what a new object is, and how it's oriented, without examining it from multiple angles first. It can also "imagine" any parts that are out of view. A robot with this technology wouldn't need to see every side of a teapot, for example, to know that it probably has a handle, a lid and a spout, and whether it is sitting upright or off-kilter on the stove. The researchers say their approach, which they presented July 12 at the 2017 Robotics: Science and Systems Conference in Cambridge, Massachusetts, makes fewer mistakes and is three times faster than the best current methods. This is an important step toward robots that function alongside humans in homes and other real-world settings, which are less orderly and predictable than the highly controlled environment of the lab or the factory floor, Burchfiel said. With their framework, the robot is given a limited number of training examples, and uses them to generalize to new objects. "It's impractical to assume a robot has a detailed 3-D model of every possible object it might encounter, in advance," Burchfiel said. 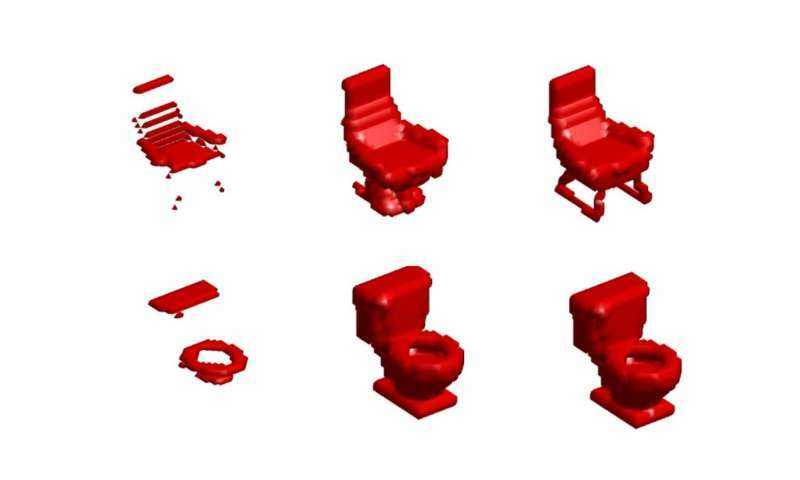 The researchers trained their algorithm on a dataset of roughly 4,000 complete 3-D scans of common household objects: an assortment of bathtubs, beds, chairs, desks, dressers, monitors, nightstands, sofas, tables and toilets. Each 3-D scan was converted into tens of thousands of little cubes, or voxels, stacked on top of each other like LEGO blocks to make them easier to process. The algorithm learned categories of objects by combing through examples of each one and figuring out how they vary and how they stay the same, using a version of a technique called probabilistic principal component analysis. When a robot spots something new—say, a bunk bed—it doesn't have to sift through its entire mental catalogue for a match. It learns, from prior examples, what characteristics beds tend to have. Based on that prior knowledge, it has the power to generalize like a person would—to understand that two objects may be different, yet share properties that make them both a particular type of furniture. To test the approach, the researchers fed the algorithm 908 new 3-D examples of the same 10 kinds of household items, viewed from the top. From this single vantage point, the algorithm correctly guessed what most objects were, and what their overall 3-D shapes should be, including the concealed parts, about 75 percent of the time—compared with just over 50 percent for the state-of-the-art alternative. It was also capable of recognizing objects that were rotated in various ways, which the best competing approaches can't do. While the system is reasonably fast—the whole process takes about a second—it is still a far cry from human vision, Burchfiel said. For one, both their algorithm and previous methods were easily fooled by objects that, from certain perspectives, look similar in shape. They might see a table from above, and mistake it for a dresser. "Overall, we make a mistake a little less than 25 percent of the time, and the best alternative makes a mistake almost half the time, so it is a big improvement," Burchfiel said. "But it still isn't ready to move into your house. You don't want it putting a pillow in the dishwasher." Now the team is working on scaling up their approach to enable robots to distinguish between thousands of types of objects at a time. "Researchers have been teaching robots to recognize 3-D objects for a while now," Burchfield said. What's new, he explained, is the ability to both recognize something and fill in the blind spots in its field of vision, to reconstruct the parts it can't see. "That has the potential to be invaluable in a lot of robotic applications," Burchfiel said. More information: "Bayesian Eigenobjects: A Unified Framework for 3D Robot Perception," Benjamin Burchfiel and George Konidaris. RSS 2017, July 12-16, 2017, Cambridge, Massachusetts. Super exciting, that's been the missing part of CV for a long time. It also makes clear vision is rooted in learning: A human guesses its a dresser, because there's a bed in the room, its not next to the bed, and a sock is lying on the floor nearby. I also just read about ghost imaging, after hearing about it on an army podcast, and I'm convinced it can unambiguously image in 3D if nothing else can, so we're basically there. Google's Tango sensors give mobile devices 3D vision (2D color, depth and motion) calibrated to an "Inertial Measurement Unit" (like the human inner ear). Giving the 3D space it's in (to the millimeter), its precise orientation in that space (to the hundredth of a degree). A "Visual Positioning System", recognizing indoor spaces (even if only seen by other devices before) and locations in them where GPS doesn't work. The reference frame for inserting Augmented Reality models too. So it will be in most phones within a few years. So Google is crowdsourcing models of places all over the world, from billions of users. And tracking interactions within them, whether annotated in apps or just associated with other user actions. All that big data is fed into Google's AI Tensorflow processing units, where Cloud processing as cheap as on a Pentium but instead as fast as the #7 "Top 500" supercomputer is machine learning what all that is. Millions of them. i believe that Ben Burchfiel technology is better than what google is making for robot to see and learn with.